When it comes to nearly everything in life I am a planner. I like to plan things in advance and map it out and have action steps with detailed instructions. Knowing what I am doing and when makes me feel prepared and like I am making the most of my time. While these are fine attributes to have for many instances (college and career planning, anyone? ), they also come in handy when getting ready for a trip. 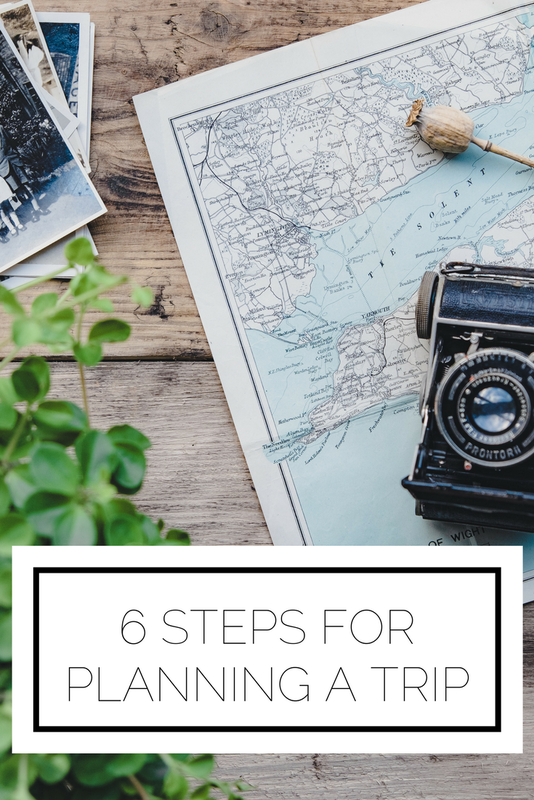 Here are 6 practical steps I used when planning my trip to San Francisco and along the California coast (take a look at all of my Cali posts here! ), while still leaving room to enjoy the spontaneous. Not a physical folder, but a digital one in your email. As you are booking hotels and activities it makes it so much easier to put everything pertaining to your trip in to one folder. When you have it all there you won't have to spend any time looking for it. Ok, so I absolutely LOVE the Google suite of apps. I use Google Docs for all of my notes, constantly use Google Slides for class projects, and Google Sheets is my go to for planning. When getting ready for a trip I start out by putting the days down the left most column. On the top most row I put the location (when changing cities), flight/transportation times, hotel with address and check-in information, dinning options, activities, and notes. All of this can be adjusted depending on your trip and goals for the vacation, but this is generally information that's a good place to start. 03. Get on Pinterest. Right now. Now that you have the barebones of your Sheet you can have the fun of filling it in. In order to find great activities my first stop is Pinterest (let's be friends over on the best social media there is!). Searching for your location with relevant adjectives like "budget," "active," "historical," etc based on what your interested in will lead you to a number of good articles. I like to create a secret board for my trip where I pin anything and everything so I can refer back to it if I need more information. Another great source is to go to YouTube (another pretty cool social media site where we should hang out) and search for vlogs of other people's trips to your destination. You can take a look at my California video here (note: if you don't want to see my family at Christmas and Joe and I going into the city, you should skip ahead to 1:39. You'll see some really cool places that you'll want to check out as well. I've heard that using Instagram is another good resource for finding unique places, but I haven't found much success with that method. Once you identify the activities and sights you want the next step is to see where everything is on the map. Hello, Google Maps (also, it seems like I should really be an ambassador for Google). You can favorite all of the different locations and start to make sense of where everything is and the best order to go in. You can also figure out public transportation ahead of time if you'd like and include that in your Sheet. Now that you know the order you can put the information on your Sheet, as well as any notes and tips you may have learned through the articles you've read. What you have to remember is that although you might have a perfectly laid out plan, being flexible is key. I love to have dinning options so that I don't have to wander around looking for a place to eat, but if you see a darling place that looks good, why not throw the plan aside and stop in? It may just end up being your favorite meal of the trip. As much as I love to have everything digital (check out my minimalist post about how to go paperless), when you're traveling you may end up without access to your phone (dead battery, dead zone) and you're going to want to know what to do next. Having a paper copy tucked in your bag is the way to go in my mind. Striking a balance between having a plan and enjoying the experience is important and will ensure that you have an awesome time. What tips do you have for planning a trip? Any methods that you've found really helpful?